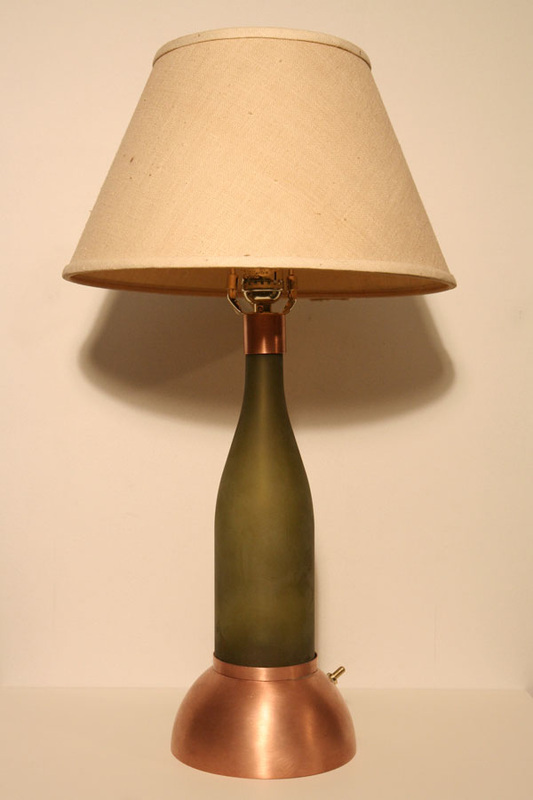 THE TABLE LAMP is the newest addition to my line of handmade recycled wine bottle lights constructed of a wine bottle, copper plumbing parts and lamp hardware. The lamp's primary illumination is provided by a low-energy 11 watt Sparsam light bulb that lasts ten times longer (10,000 hours) than a standard incandescent bulb. In addition to the primary bulb, the bottle is also lit by 3 small LED bulbs that can be turned on separately or simultaneously with the main bulb. The small LEDs work great as a night light. 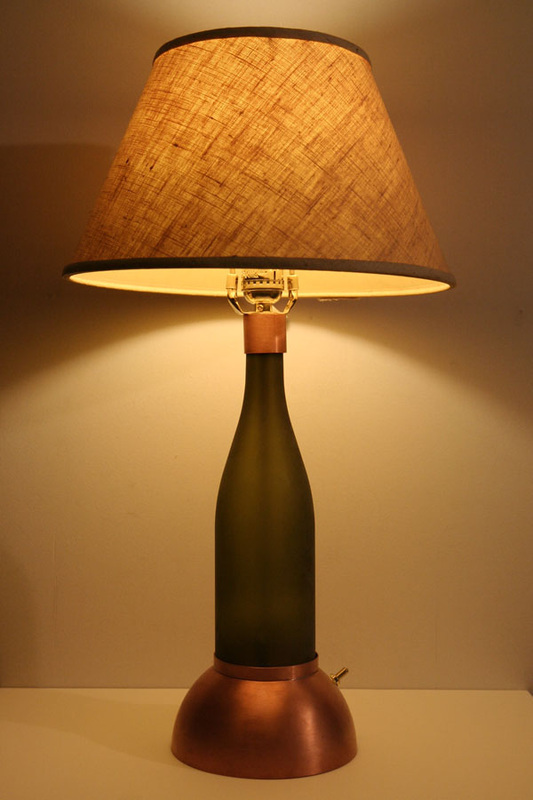 The height of the lamp pictured here is 21 3/4" with the bottle I have chosen, but each particular wine bottle will affect the height. Sorry, the lamp shade is not included. The cord here is black cloth covered with a black plug, but standard white, black or clear cord is available. The finish on the copper parts can be made raw, brushed (pictured) or polished. The bottle is sandblasted and comes in: green, brown or clear, and the shape is either cabernet or riesling. 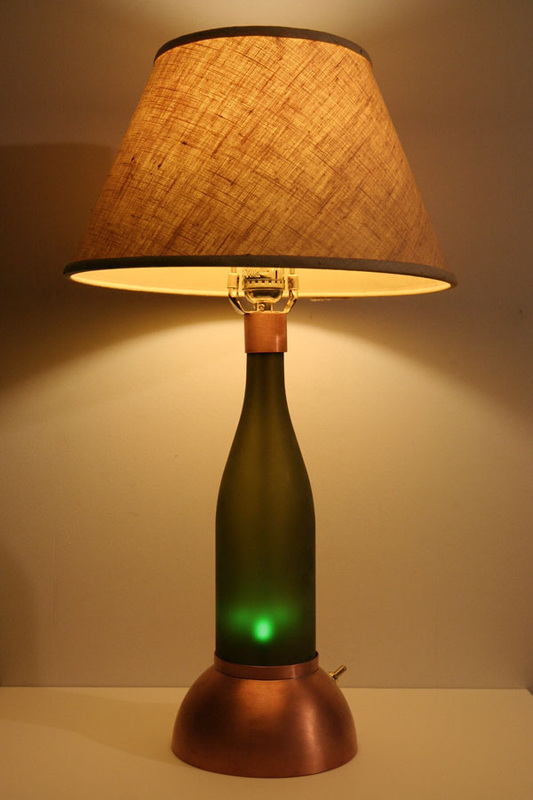 These lamps are made to order and can be customized to suit your personal taste and design needs.